Widely considered as the first ever horror film, it follows a man called Francis telling an old man about his story of a travelling Dr. who exhibits Cesare, a somnabulist (sleepwalker) who can predict the future. When Francis and his friend Alan and his wife, Jane, visit the fair, the somnabulist predicts Alan will be murdered before the morning sunrise. The crime subsequently comes true and the town is gripped with fear as other grizzly murders take place. Francis suspects the somnabulist who is relentlessy guarded by Dr. Caligari. 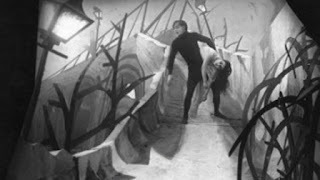 After the authorities realise they have arrested the wrong man, they pursue Dr. Caligari and discover he is guarding a dummy while the Somnabulist is trying to abduct Jane. Cesare is chased and ultimately dies. 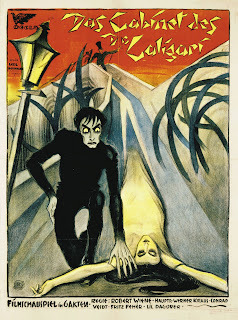 Francis follows Dr. Caligari to a mental hospital, however, none of the staff recognize the name as a listed patient. 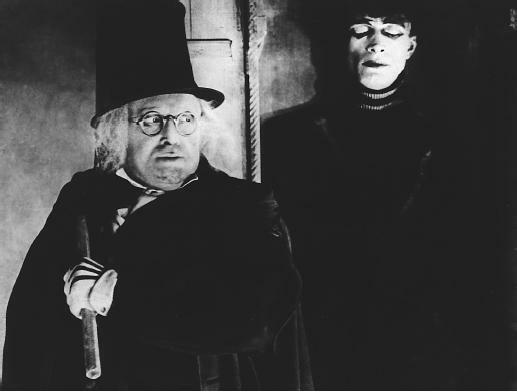 Francis is taken to see the director of the hospital who indeed turns out to be Dr. Caligari himself. Francis returns with the Police, when they investigate the Directors office they find notes on an old tale of a Caligari who used to hypnotize somnabulists to murder at his command. We return to the start of the film with Francis still takling to the old man. As they walk into another room, they discover Dr. Caligari with Jane and the Somnabulist. In a U-turn I wasn't expecting, it turns out that Francis is a patient at the hospital and he has manifested the fictional character of Dr. Caligari. This film is clearly heavily influenced by the expressionist movement. As environments and concept worlds are the subject of our next project, I was keen to see what this film had to offer. I was flummoxed by the first scene where we find Francis talking to the old man in a surprisingly normal setting, the only strange element is the wandering, emotionless women. But when we move into the flashback scenes, the movie set pieces dramatically change. Perhaps this should have been my first clue that what we were seeing, was an insight into Francis' fractured mind? "While Hollywood was honing its storytelling technique with the evolution of its own brand of realism, Germany was originating an entirely expressionistic cinema that would influence film noir, science fiction, horror, and the likes of Tim Burton and Terry Gilliam." The surroundings have a strange distorted, almost painting look to them. Dr. Caligari's caravan home seems barely big enough to fit a person from the outside, but when we cut to scenes inside it, there is ample room. The heavy contrast of dark and light is evident throughout, even in the make-up of the characters, screaming expressionism. 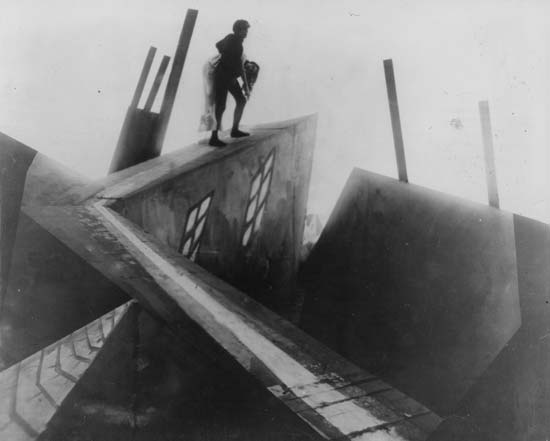 "A landmark of Expressionist cinema and contains many dazzling set pieces." I was pleasantly surprised with this film, especially with the dramatic twist at the end. If ever there was evidence that movie making is a form of art, this film is undoubtably a candidate. When the credits were rolling I couldn't help but think of it as a 1920's version of Scorsese's Shutter Island. "With a zombie-like killer and twist-in-the-tale this anticipates everything from psychological thrillers to stalk 'n' slash."